Hitachi’s finger vein authentication technology was named the Breakthrough Innovation of the Year by a national trade journal during the CardTech/SecurTech conference this week. Powered by the StepNexus MULTOS smart card platform, the finger vein system relies on a clearly identifiable and unique pattern of veins in a finger. Without actually touching a scanner, a person’s identity can be verified. SAN FRANCISCO–Card Technology magazine announced that its international panel of experts named Hitachi Ltd., the 2006 recipient of its annual “Breakthrough Innovation” award in recognition of Hitachi’s deployment of finger vein biometric authentication technology, powered by the StepNexus MULTOS smart card platform. The advanced finger vein authentication technology developed by Hitachi relies on clearly identifiable and unique pattern of veins in a finger. Without physically touching a scanner, a user’s identity is verified while dramatically increasing security and fraud detection. StepNexus MULTOS smart cards support matching the finger vein image within the secure confines of the smart card. Leveraging the multi-application capabilities of MULTOS, the finger vein application can be issued alongside the EMV (Europay, MasterCard, Visa) payment application of the card issuers. 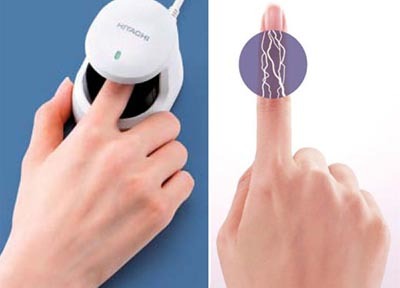 Hitachi Finger Vein Scanners have been adopted by members of the Japanese banking community. The scanners are currently being deployed around Japan for accountholder authentication in eight Japanese banks including Kyoto bank, Joyo bank, and Fukuoka Bank. This prestigious smart card industry award is bestowed annually to the newest and most significant and innovative use of smart card technology implemented during the previous year. Hitachi, Ltd., headquartered in Tokyo, Japan, is a leading global electronics company with approximately 355,879 employees worldwide. Fiscal 2005 (ended March 31, 2006) consolidated sales totaled 9,464.8 billion yen ($80.9 billion). The company offers a wide range of systems, products and services in market sectors including information systems, electronic devices, power and industrial systems, consumer products, materials and financial services. For more information on Hitachi, please visit the company’s website at www.hitachi.com.